COLOGNE, Germany – A German cardinal said various commemorations of the collapse of the Berlin Wall ignore contributions by the Catholic Church. “It is simply untrue, as many critics maintain, that the church was introverted – just the opposite,” said Cardinal Joachim Meisner of Cologne, who served as bishop of Berlin 1980-88. 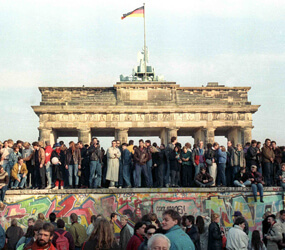 On Nov. 9 Germans will commemorate the 1989 fall of the wall, which divided West Germany from the communist-ruled East Germany for 28 years. The anniversary will include a “Festival of Freedom” in Berlin, during which 1,000 giant foam dominos will be toppled along the route of the wall. In an Oct. 26 article in the Die Welt daily, Cardinal Meisner said that under communist rule the Berlin Diocese never adjusted its boundaries, and church officials refused to participate in state ceremonies. Berlin became an archdiocese in 1994. Cardinal Meisner said most commentaries had focused only on the final steps in Germany’s reunification, without mentioning “the 999 steps taken earlier,” in which Catholics played a key role. He added that lay Catholics had offered a “biblical testimony of nonparticipation” by boycotting communist institutions, such as the “Jugendweihe” youth enrollment, and by continuing daily social and charitable activities. Cardinal Meisner said some commentaries recalled the role of Lutheran churches as gathering places for protesters, while ignoring key events such as a 1987 Catholic Katholikentag festival that brought 100,000 people onto the streets of Dresden. “My words to the main Mass at that festival, that we would follow no other star than the Star of Bethlehem, were clearly understood as a political signal,” the cardinal added. “I think today of the many people who helped bring about the events of Nov. 9, 1989, through unspectacular resistance along the way. They deserve their own monument, or at least to be included in the historical record,” he said. Crossing points in the wall were opened by East Germany’s communist regime during a wave of revolutionary change in Eastern Europe, paving the way for Germany’s formal reunification in 1990.